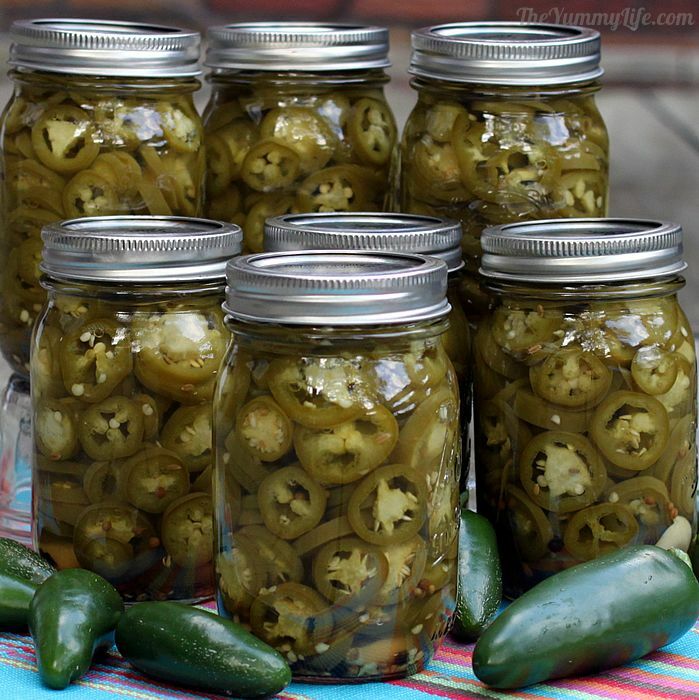 This recipe makes 4 pint jars of jalapenos. You can double or triple the recipe to make extra jars to give as gifts. I've used this economy priced set since I first started canning. It's processed hundreds of jars of jalapenos, salsa, jam, marinara sauce, and more. It's important to protect your hands when working with chiles. Otherwise, their "hotness" will remain on your hands, and it can hurt if you touch your face or eyes. This delicious, healthy vinegar is made from organically grown apples. Great flavor with economical, bulk pricing. Click below for other organic spices. This is my go-to mixing bowl. It's also handy for measuring the jalapeno slices. Keep these in the fridge for months, or can them to last longer. 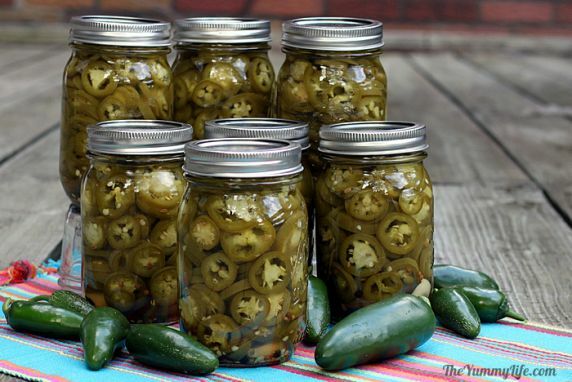 These easy refrigerator pickled peppers are also suitable for canning. Add them to nachos, sandwiches, salads, and more. Great for gifts, too. 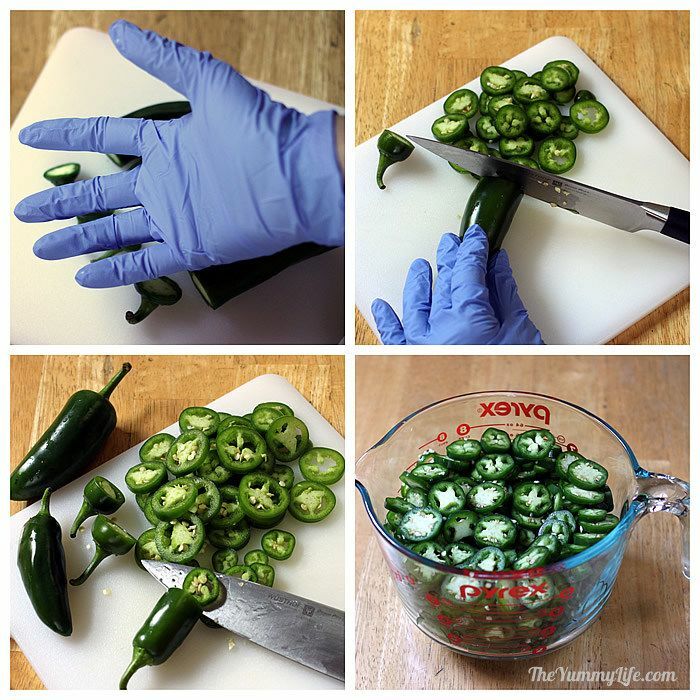 Thinly slice jalapenos in 1/8" rounds, discarding stem ends. Wash 4 pint jars & lids in hot sudsy water according to standard canning procedures. Keep jars warm until it's time to fill them. In 2 quart pan, combine vinegar, water, & sugar (or honey); heat until just before it starts to boil. Add salt, pepper, cumin, coriander, bay leaf, garlic, (and Pickle Crisp, if using) to each jar. 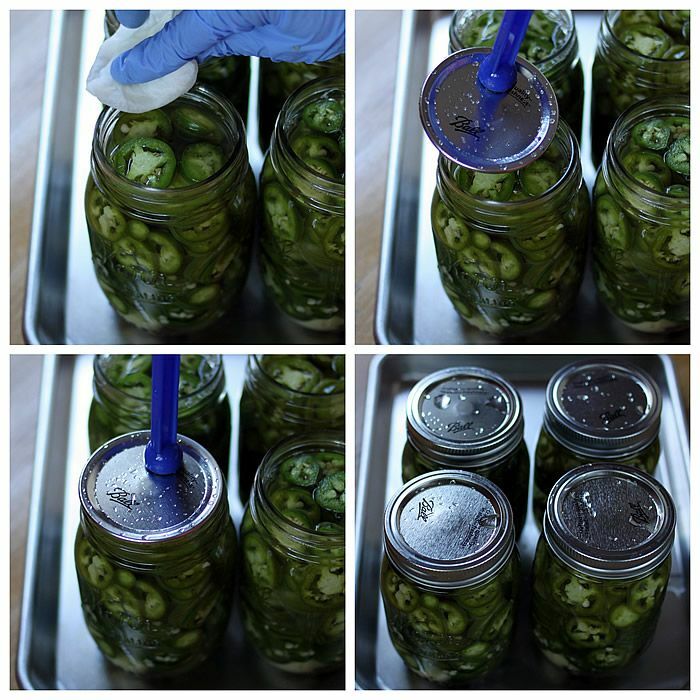 Add jalapeno slices to jars, pressing down and packing them in compactly until jars are filled. For more attractive appearance, use a chopstick or your finger to position some slices vertically along sides of jar. 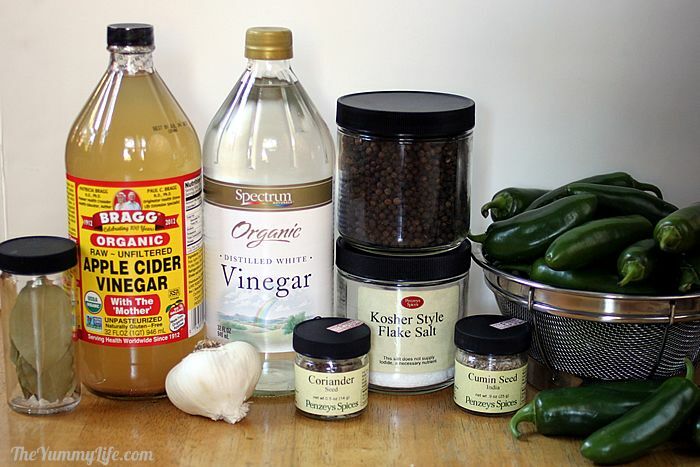 Pour hot vinegar mixture into each jar, leaving 1/2" head space. Insert bubble remover tool (or chopstick) down side of jar and press in toward center to release any bubbles. Clean jar rims with wet paper towel. Add jar lids and rings, making them "finger tight." 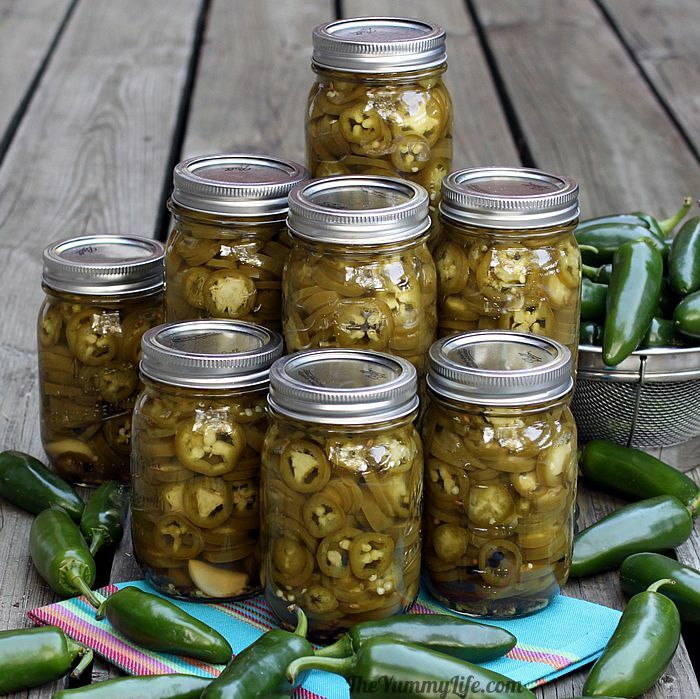 FOR REFRIGERATOR PICKLED PEPPERS: Allow jars to cool to room temperature and then store in fridge. Allow to marinate at least 3 days before eating. Good for several months. 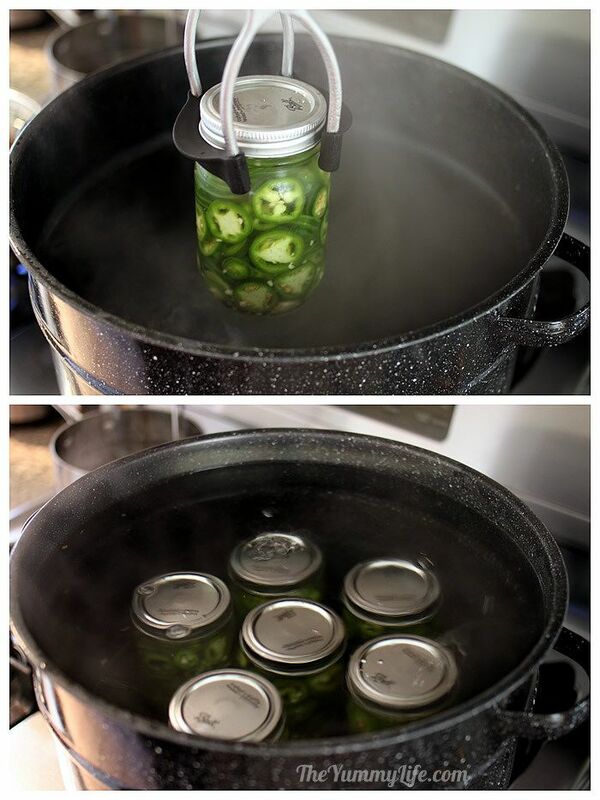 FOR CANNED PICKLED PEPPERS: Process using standard USDA water process canning procedures. 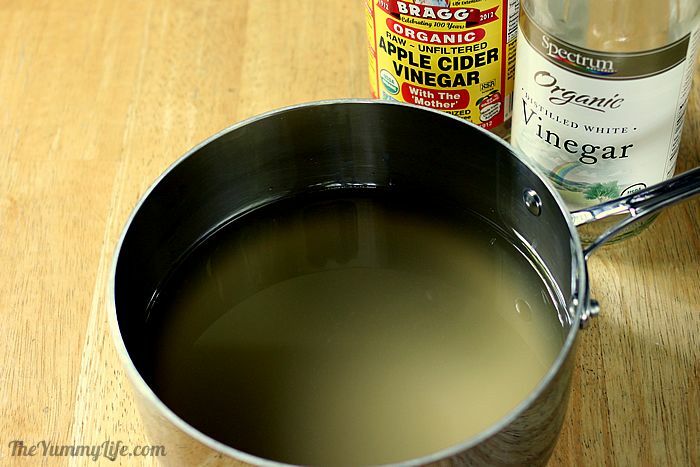 --Fill water process canner or large pot with enough water to cover jars with 1" of water. Bring water to boil. --Place hot, filled jars inside pot, return water to a boil, and process 12 minutes. --Turn off heat, remove cover, and leave jars in water for 5 minutes. --Remove jars and cool, undisturbed for at least 12 hours. --Store in cool, dark place. May be eaten within a few days, but best if allowed to cure for 4-6 weeks. --Good for at least 1 year. --If any jars don't seal, cool and move to refrigerator where they will be good for several months. I've been away from home most of the past month and returned to a neglected garden overflowing with jalapeño peppers. I harvested 6 pounds of these hot beauties--looks like they didn't mind being ignored. I was short on time and decided that the easiest thing to do would be to pickle them. And, boy was it easy! 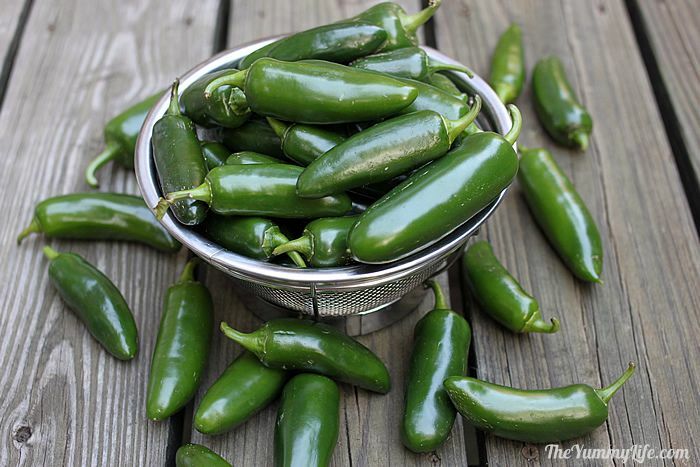 If you haven't grown your own jalapeños, look for them in grocery stores and farmer's markets. They're often quite affordable. This recipe is WAY better than those store jars of jalapeños or the ones served on nachos at movies and ballparks. I've added a few seasonings that give these pickled jalapeños just a little something extra. If you like spicy hot food like me, you'll love having a jar of these on hand in the fridge. I use them on nachos, quesadillas, sandwiches, paninis, burgers, salads, and chili. You can take an ordinary grilled cheese sandwich or burger to a whole new level simply by adding a few of these jalapeño slices. Refrigerator pickled peppers -- simply assemble the jars and refrigerate them. After marinating in the fridge for a few days, they're ready to eat. They'll be good stored in the fridge for several months. 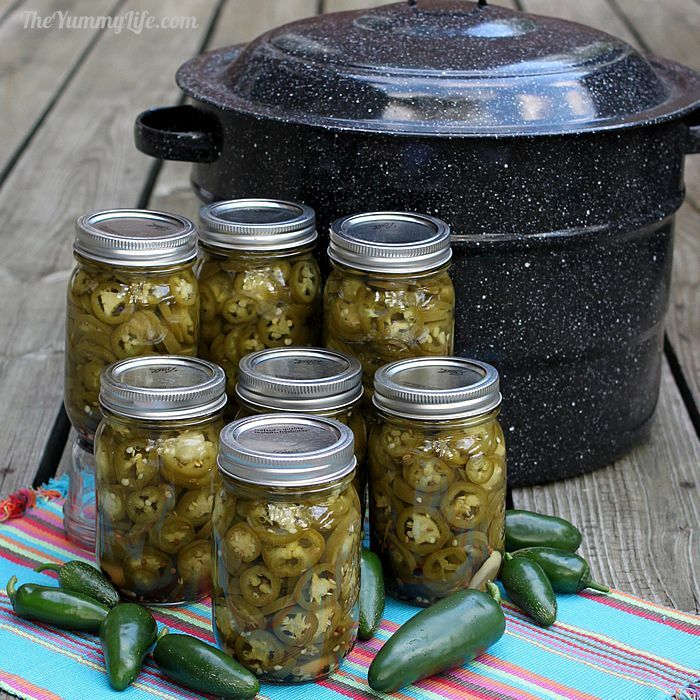 Canned pickled peppers -- This recipe is suitable and safe for water-process canning. That means they'll be shelf-stable for at least 1 year. This is my preferred option for making a larger quantity at one time. Canned peppers can be stored in a dark pantry so they don't take up a lot of fridge space. If you're new to canning, see my post: Step-by-step Canning Tips. Make 1 jar or many jars. My recipe gives quantities for making 4 pint jars of jalapeño pickles. However, I'll tell you how to modify the amounts for whatever number of jars you want to make, from 1 jar to gazillions! Just to give you a ballpark idea so you can decide how many jars you want to make, it takes about a half pound of whole jalapeños to fill one pint jar (after they're sliced). Great for gifts. 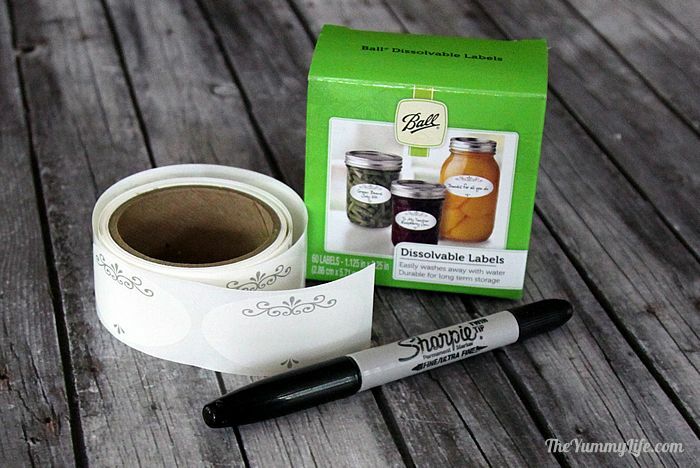 I've made some labels you can add to your jars to add a finishing touch and make them ready to have on hand for gifts. Home canned goods are a perfect gift for those you know who enjoy spicy food. I'll be using these for host/hostess gifts. Look for my printable labels further down in the post. Pickle Crisp--optional (not pictured). A smidgeon of this added to each pepper jar results in crispier peppers. It's safe and easy. I add it to everything I pickle. WARNING: Wear plastic gloves when you're working with chiles. The hot residue is difficult to wash off of your hands. If you accidentally touch your face or eyes, you may feel a very unpleasant burning sensation. I prefer to use disposable gloves, because it's difficult to wash off the hot residue. WARNING: Adhere to canning safety guidelines. It's important to follow the jar preparation and processing recommended by the USDA. If you want more detailed canning information, I recommend the Ball website. They are the ultimate authority, and their site is loaded with detailed information and recipes suited for canning. Step 2. Prepare the jars & lids. I use pint jars for pickled peppers. Wash the jars in hot sudsy water, rinse and dry them. The jars don't have to be sterilized, since they will be processed for 10 minutes (as per updated canning guidelines from Ball). The washed jars need to be hot when they're filled with the hot pickle mixture. Keep the jars hot in the canner filled with simmering water. Or, my preference is to put them on a tray in an 180 degree oven to keep them hot until it's time to fill them. I think that's easier that juggling them in and out of hot water right before filling them. Step 3. Heat the vinegar and water (plus optional sugar or honey) almost to the boiling point--steaming, but not bubbling; cover and keep it hot until needed. Step 4. 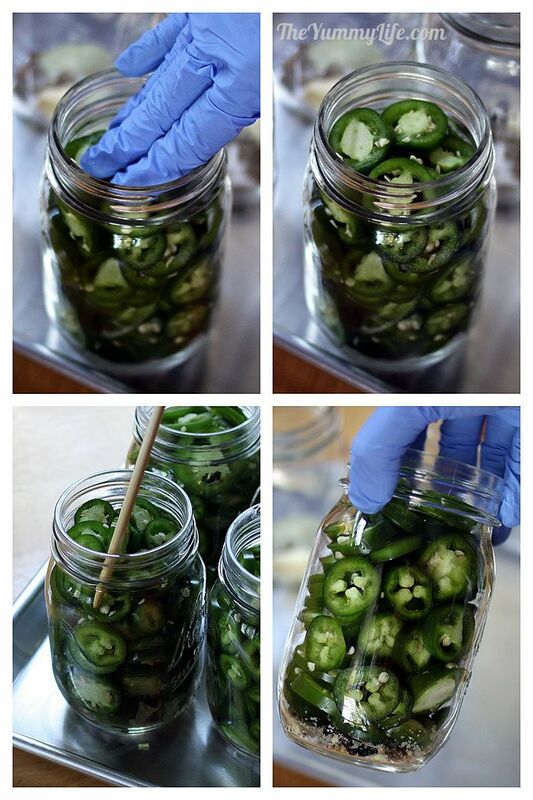 Slice the jalapeños into thin rounds, approximately 1/8" thick. Hold them by the stem end as you slice, and discard the stems when you're through. I add them to a large measuring bowl as I slice--you need 8 cups of slices to fill 4 pint jars. Step 6. Add jalapeño slices to each jar. Press them down firmly as you add them in order to pack the slices tightly into jar. For a more attractive appearance, insert some slices vertically around the edge of the jar (otherwise, they tend to stack like coins). I used a chopstick to position some of the slices around the jar edges. Step 7. Add hot vinegar mixture to each jar, leaving 1/2" headspace. Insert a bubble remover down the side of the jar and press toward the center to release any bubbles (you can use any long, thin object like a chopstick). Step 8. Clean jar rims with a wet paper towel. 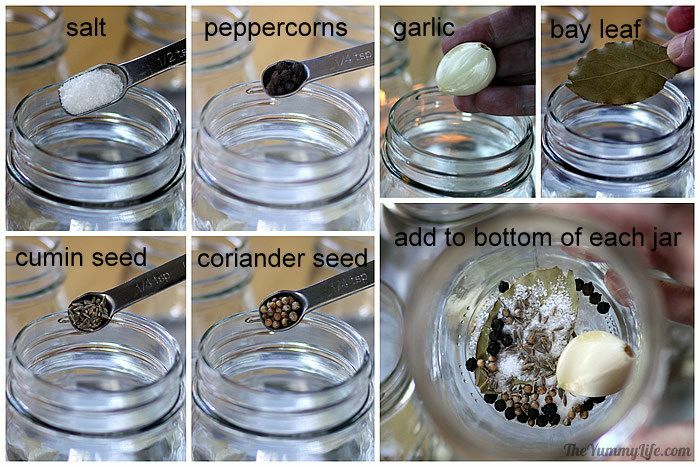 Add a jar lid to each jar. Screw on a ring until it is "finger tight." 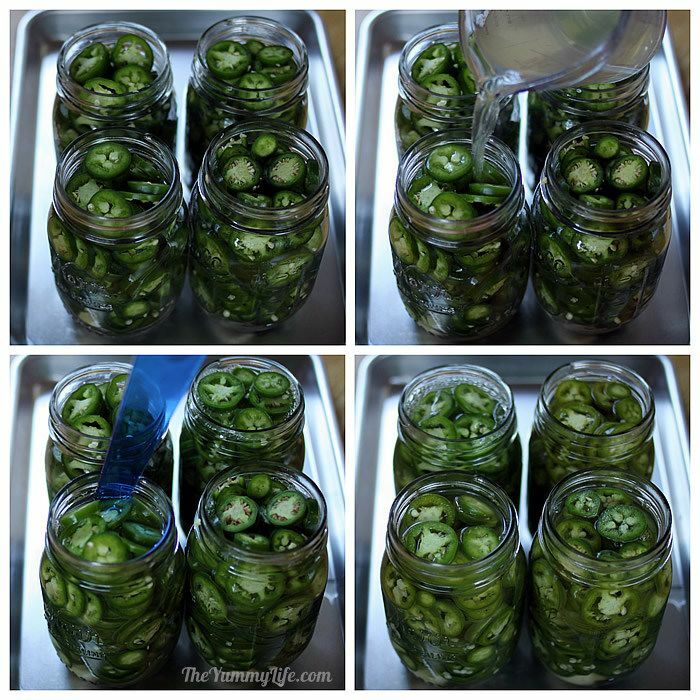 For refrigerator pickled jalapeños, you're done! Let the jars cool to room temperature, then put them in the fridge and let them marinate for a few days (at least 3 days) before eating them. They will keep in the fridge for several months. Step 9. While you're preparing the peppers and filling the jars, get your water boiling. Add water to a water-process canner or large pot that is tall enough for the water level to be 1" higher than the jars. Bring water to a boil, cover, and keep hot until jars are ready. Step 10. Use a jar lifter to insert each jar vertically into the boiling water. Step 11. Cover and return water to a rolling boil. Process jars for 12 minutes. Turn off heat and remove lid; leave jars in hot water for 5 more minutes. Use the jar lifter to remove each jar vertically and set on a towel. Within 30 minutes after the jars are removed from the water, you know they've safely sealed if the center of the jar is slightly indented (it shouldn't give when you press it); sometimes you'll hear a popping noise when they seal. Leave your jars out to cool undisturbed for at least 12 hours. Store your sealed, processed jars in a cool, dark place (a cabinet or pantry is fine as long as it doesn't get too hot); a basement is ideal. Although you can eat them within a few days, the flavor is better if they cure for 4-6 weeks before being opened. They are shelf-stable for at least 1 year. 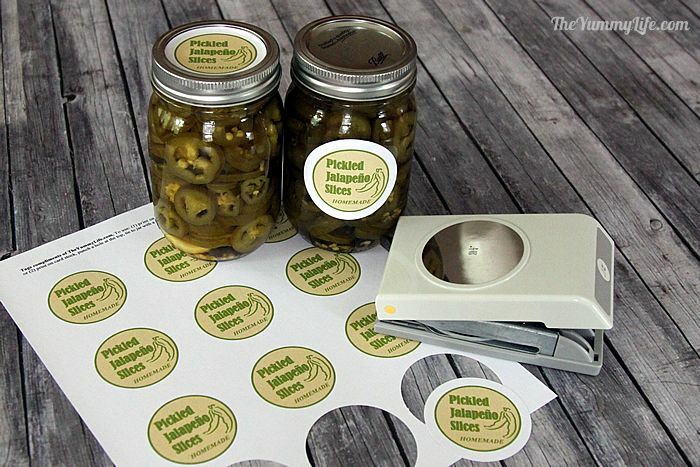 Download printable jar labels. 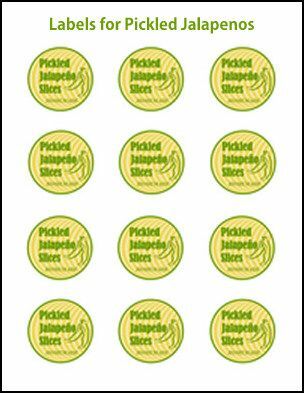 Print a sheet of these labels for adding the finishing touch to your jars for personal use or to give as gifts. Then, just for fun, try to say this tongue twister 5 times, real fast (slightly modified to fit the occasion): "Peter Piper packed a pint of pickled peppers."